SAN DIEGO, CA. Lines of early voters are causing an hour and half wait as crowds jam the County Registrar of Voters on Ruffin Road. 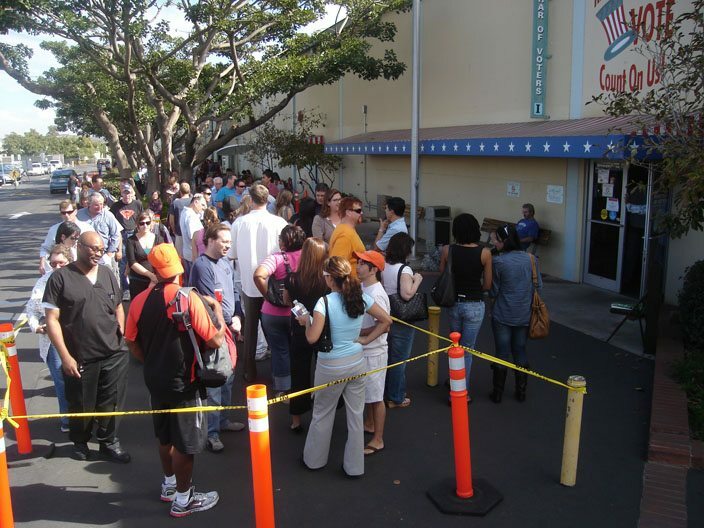 This is unprecedented in the history of recent San Diego elections – unprecedented for so many voters to vote so early and in such massive numbers. This is true of any recent election and possibly is true for anything held within decades. Several Registrar workers confirmed this for me. The Associated Press reported Thursday that early votes and absentee votes have amounted to more than 18.5 million, based on reports gathered over the past week. Millions of additional early votes are expected to be added over the next few days. In comparison, the absentee/early vote total for the 2004 election was 24.6 million. 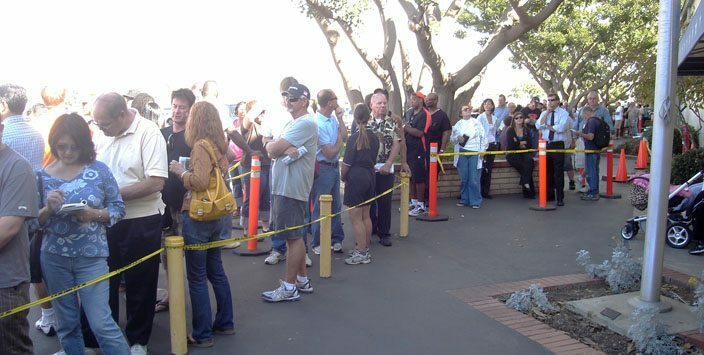 The line begins at the front door, runs down the building along the shaded patio and into the causeway. A very unusual sight it turns out. I asked several temporary workers at the Office who were on their breaks, and they informed me that the lines form around 9:30 in the morning and last all day. It has been like this all week, several said. I spoke to David Morton, who claimed he was just a clerk, but who was authorized to speak to the media. He sat me down at a desk inside the Office and gave me a copy of the important dates and time changes. He said voting has been “phenomenal” but he assured me that the Registrar was indeed prepared for it. He confirmed that the lines have been long all week. He’s the one who every now and then traverses the line looking for voters who already have voted and just need to drop off their ballots. But he had not seen such lines in the 5 years that he’s worked there. 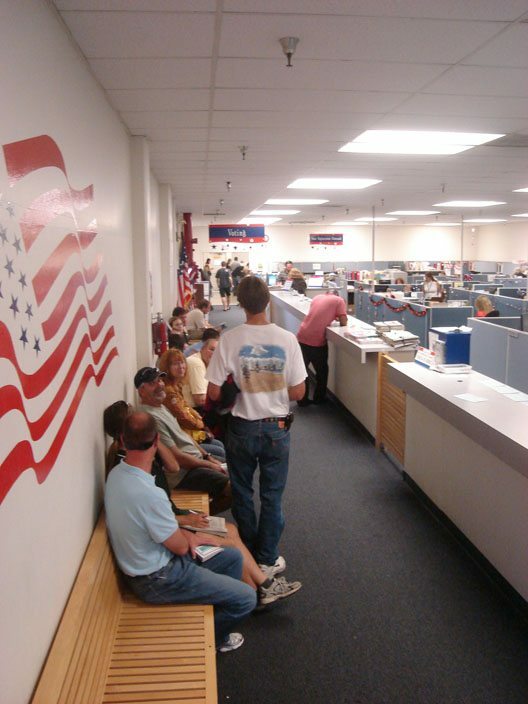 Usually the Registrar is open from 8 to 5 and on this Saturday and Sunday, it will also be open those hours – 8 to 5. Election day it will be open at 7am. I asked several people why they were voting early, and most either were going out of town election day, had to work all day long that day, or were even moving and wanted to vote here. No one seemed disgruntled to have to wait so long. It was like waiting in line at a movie. Only better because when you walk out here you still don’t know what happened, so it’s like a serial with still a lot of anticipation and tension. Of course, it’s better than a series. Better than a movie. This is our real life! This is what democracy looks like. I took my mom to the registrar of voters yesterday. She is 87 years old. She is getting forgetful, finding it difficult to find the word she wants to use. But every single day, she asks if we are going to “do that thing” for the election, or for Obama, or what ever, to get her point across that she wants to be sure to be able to vote! She understands the importance of voting early, and worries because of it. She watches the T.V. almost all day, watching the speeches, polls, and debates. She was NOT a T.V. watcher before this election, in fact it irritated her. She says she has never see the enthusiasm in her life time, that this election has had. And she sometimes tells me, (proudly), that she thinks she convinced one of her friends, they should vote for Obama. We didn’t get to vote yesterday, the lines were to long. But I can tell you for sure…….she will get her vote in! the early polling of early voters in new mexico gives obamaman a SEVENTEEN POINT LEAD. while i doubt that the final numbers will be that close, i do feel now that it’s for real….the bushies are about to get their asses handed to them. yes, it’s important that everybody vote….and it’s even sweeter if the final result is lopsided! in the tank for obama? only till january 21st. I can’t breath until next Wed……….My cousin in Detroit e-mailed me and asked if we had any relatives in Canada, just in case. Seriously! I’m not naive enough to think Obama is all the answer,!!!! but to face at least 4 more years of this!!!!!!!!!! Anyhow, like I heard Bill Maher say, about Obama, “I hope he’s lying…..”(talking about religion and such./ Me too! I cracked up,and so GOT what he meant. Just GET ELECTED PLEASE! Up here in Shasta County where Republicans outregister Democrats by 45,000 to 28,000 (about 18,000 small parties and decline to state) the local schoolkid poll showed 61% for Obama (highschools and middle s chools) . . . and that is also what democracy looks like. Hooray for the future!! Monday A.M…….Deed Done! My Mom got to vote this morning. At 7:a.m., the lines and parking were unreal. After much waiting we were told she could go by the big white tent, and a ballot would be brought out to her. BUT, I couldn’t park my car there, because I had an Obama sticker. I left her there in the care of a sympathetic security guard. NO parking. I finally talked a worker to let me park in his spot, and promised I would replace the orange cone when I got back. Now I can rest, and not have to answer the questions about when she was going to get to do that thing for the voting, or election…..which ever word she could think of at the time! She has been a part of much history, but this is really a special one for her. She’s happy, now the the results to cheer about tomorrow! And thanks Dickie, she always sends her love to all of you she’s know for so long. It’s a madhouse…I work nearby, took me three light cycles to get across the intersection at Ruffin on the way to lunch. Cars parked all the way down Clairemont Mesa to the 15, mobs of people everywhere. Lots of “No on 8” and a couple “Yes on 5” demonstrators, I thought at was cool…as was the little old lady rocking out and waving an Obama sign at the entrance to the freeway leaving town this morning.